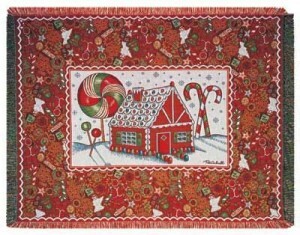 Isn’t this a lovely Christmas Gingerbread House Tapestry Throw? The colors are gloriously warm and inviting. This one would look stunning hung on your wall or over your favorite chez lounge as it is so festive with candy canes and suckers and a beautiful border of Christmas goodies! Visit here for details.